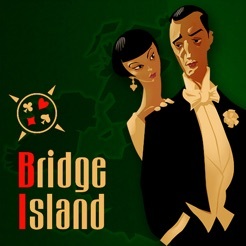 BridgeIsland is the live experience of playing Bridge on the Internet. "Instant Play" quickly finds an empty seat where your partner's level is close to yours. 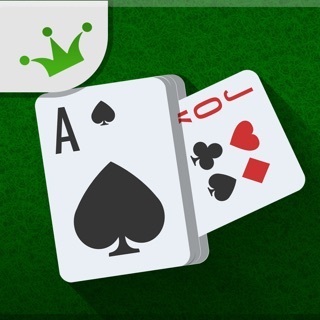 "Select Table" will bring you the tables that you may choose from, one by one, showing who had already been seated as your opponents and possible partner. You can request friendship with players, and if confirmed you can invite them to play with you as your partner. 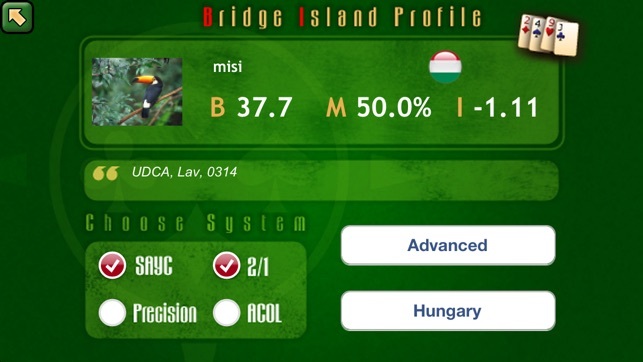 All players have a profile with information about their playing level, bidding systems, some personal quotes and a voluntarily uploaded picture. Just tap on a player's name during play to take a look at it. Your own profile can be managed on your phone or using BridgeIsland's website. 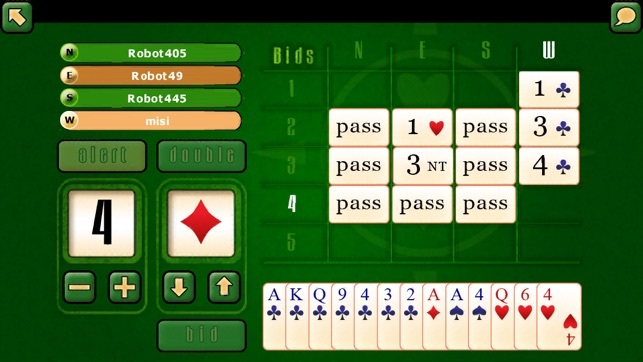 During play, you can alert your bids, claim remaining tricks, request undo or new game. 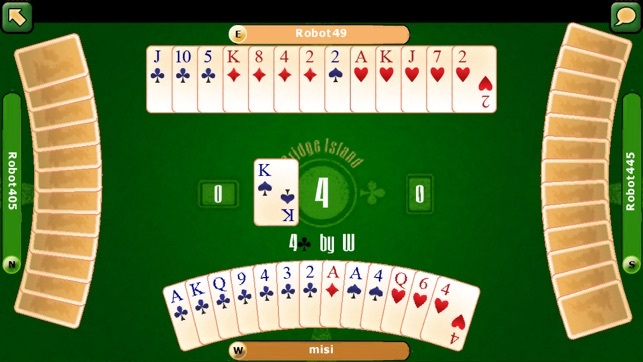 Upon mutual agreement, a player also can be removed from the table to keep the game going in case someone might have internet connection problem. Played deals are saved in order to calculate players' performance and for your review later on using the website. Deals are scored based on International Match-points. Upon first use, you will be requested to register with a user name and password to have access to the service. 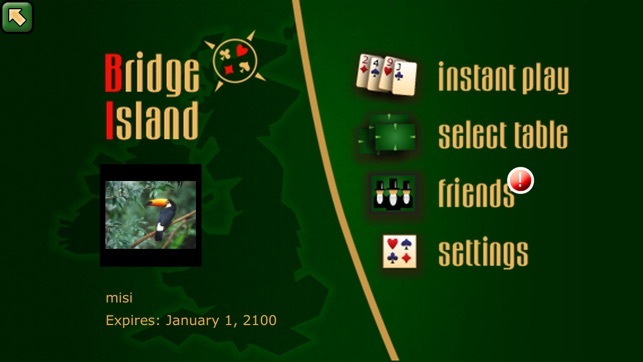 Your user name remains as you first entered, your password can be changed while managing your profile on www.bridgeisland.com. Install now and enjoy playing this wonderful game with others. 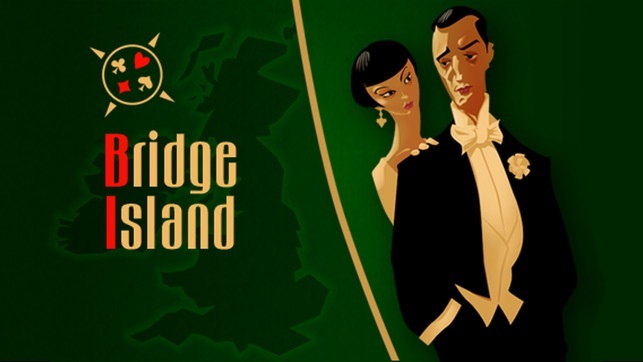 the best bridge game ever! !